15" x 8" x 9"
"The Man of a Thousand Faces" certainly has fascinated countless people over the years. Along with Charlie Chaplin, Buster Keaton and Clara Bow - he was one of early cinema's greatest talents. Of all his incarnation, my favorite is simply him, smiling. Every time I see that face I think of my father. There's an enthusiasm and quiet confidence, but it's a complex face, full of a lot of layers of life and feeling. I'm sure my father, the consummate engineer, would not have liked the association with an actor, but there are similarities in their life stories. Both had very rough lives but forged honorable careers. They were both of a certain generation of men…you don't see faces like those any longer. 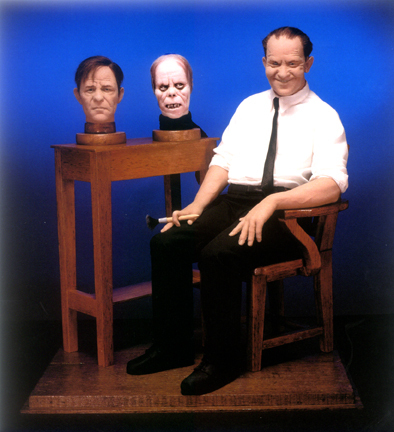 Lon Chaney's parents were both deaf and he learned to communicate with them with his face and gestures. His father was a barber, and Lon would entertain the family by doing pantomimes of the customers as well as people from the town. These early facial gymnastics must have been quite marvelous because even without makeup he changes persona almost completely. The face on the left is from a movie where he played a gangers -- how is that the same man who is smiling on the right? And when he used his talent as a makeup magician the transformation is even greater. They say he used wax, false teeth and grease paint to become the "Phantom of the Opera" in 1925, but the collapsing of his nose implies something more - he also created a crevasse in his cheeks and flattened his ears. (When asked about it, Chaney would only say the inspiration was the faces of Wounded WWI veterans.) By the way, each face in this trio has the exact same skull underneath with the slight exception of the monster - I had to chip part of the nose bridge to create the profile. It makes me wonder - did he break his nose to do that part?